A mellow rock song about a young man coming of age and moving on from his parents. Larry Thomas, an actor most widely known for his role as "The Soup Nazi" from the TV show Seinfeld has been acting, singing and writing for 40 years. While co-producing, co-directing and co-starring in his new TV sitcom pilot, Dads! 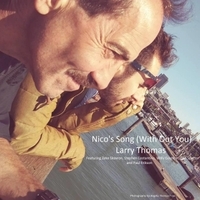 Larry decided to write a theme song for the shows lead character, Nico, an 18 year old boy wanting to become a man. With the help of a great record producer, Stephen Costantino and his recording studio, Gamorrean Sound, Larry's composition was given a great mellow rock treatment.